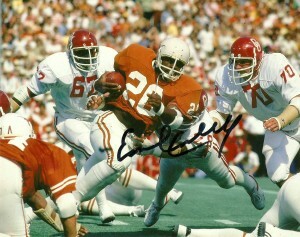 Well Earl Campbell puts the saying, “You can’t look a gift horse in the mouth.”, to the test with this autographed photo. While I was happy to once again get Earl on something I would have been a bit happier if it was on a card. I had even ordered a couple thinking I might have a chance at getting him, but when I arrived at the event, the promoters and handlers for the event made it clear he was only going to sign the stock photo memorabilia. Still when Earl was chauffeured up in his signature black GMC with a handicapped placard I couldn’t help but feel slightly sorry for the guy. He’s been through a heckuva lot, and people just keep heaping more on him, in addition to treating him like a demigod. A woman in front of me said he had a responsibility to sign autographs, and basically make people happy because of his celebrityship. I really disagreed and tried to be more diplomatic about it. We are all human after all. When Earl emerged from the passenger side of the vehicle, I’m sure many fans were surprised to see what condition their hero of lore was in. (It’s hard to live in an information vacuum, but it’s much easier if you are only a casual fan of sports and did not see the 30-30 ESPN presentation on him.) Earl was clearly using a walker, and had to be helped to the table. 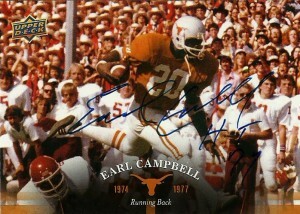 While I had heard differing tales of his stubbornness at events, such as when he only signed “E Campbell” at the Fan Fest in 2012, or how he both refuses to allow for personal photos with him or outside personal items now at non-paid signings, Earl for the most part seemed in good spirits. While I was not going to poke the bear, I noticed that on a few larger families of autograph seekers at the beginning, he simply penned “Earl”. First his legs. Now his hands. As the line coiled through the queue and out into the street, I realized how thankful and fortunate I should be to even get an autograph. A few people who were there went up and complained to his hapless son about how they had driven from here or there and wanted to get Earl’s autograph on some sort of memorabilia they had packed, but they really had no excuse, especially after receiving a charity autograph from a Texas and NFL great, clearly doing this out of the kindness of his heart and for some pocket change. Again, the GMC event was very mechanical. When I said to Earl: “Luv’ Ya HOUSTON OILER Blu’ “, he was too busy talking and smiling at his handlers, that were interfering with the whole mystique of the event. I doubt he even heard me. It was a poignant end to an uneven event. I could not pass up the Fiterman Autograph Event in 2012, which included Heisman winners Earl Campbell and Billy Cannon and a lot of Oilers I had TTM woes with. 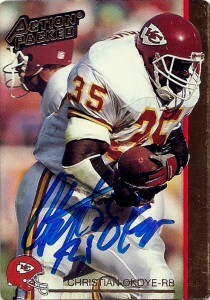 The price was expensive, but cheap when prorated out in bulk, averaging out to under 20.00 an autograph. 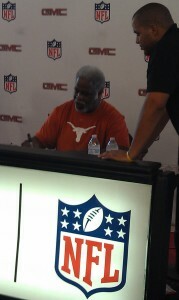 Earl Campbell’s alone typically goes for $100.00 per item, making it all a worthwhile deal. While there was hiccups in shipping due to overwhelming demand, I did indeed receive all the cards back that I had wanted signed, including this gem. I skipped over Earl at the 610 event back in August, because I anticipated the long lines. He also was signing items shorthanded, with ‘E Campbell’ and no inscriptions. This set off a lot of collectors who screamed murder about the shortened sig. I really didn’t care, but to get this one back with the full signature and his number certainly made my day. 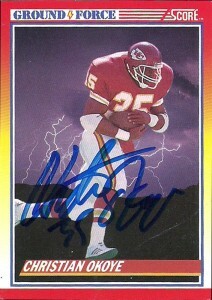 The Tyler Rose was the 43rd winner of the Heisman Trophy, and part of the 1991 NFL HoF class. He’s become a prominent businessman around Austin, slowly building a meat products enterprise under his name. He also has a restaurant in the ABIA airport as well. Exerpt from Bum Phillips, NFL HoF presentation speech: Thank you. If ya’ll were looking into this sun, you’d know why I’m wearing a hat. I’d like to thank the Hall of Fame for giving me the opportunity to come back up to this part of North Texas. [This isn’t Texas.] Oh, it’s not? There’s a whole lot of people that deserve congratulations — the Hall of Fame, the enshrinees — but I want to send a special congratulations to the people of Canton, Ohio and the state of Ohio for that parade this morning. That was — That was outstanding. That’s the best think I’ve ever seen. I’ve had some tough jobs in my life, but believe me, this is one of the toughest: Introduce a guy that made almost 10,00 yards, a guy that’s been in every newspaper and on every TV camera for the last 30 days, a guy that’s the best running back that I’ve ever seen in my life — and they tell me to do it in less than four minutes. Some of his runs lasted that long. So I — I stop and I get out and I go over there and of course put the mule out of her misery and come back — no Earl Campbell. About that time I hear “Boom! Boom!” and I look and here come Earl running across the hill — said, “Bum, let’s get out of here; I got his horse and his dog.” And if that ain’t loyalty, I don’t know anything about loyalty. The last time I attempted to get Christian’s autograph was in February of 2010. He’d be the first RTS I’d notch on my way back into the collecting field. I really wanted to get his Pro Set 1990 LL card, Score 1990 Hot Card, and his Score 1990 Ground Force cards signed. I put the cards back into my box and forgot about them. I recently decided to do some volunteer work since this job market has been so frustrating. After doing a bit of research I recalled that Christian had a youth skills camp that he runs in Rancho Cucamonga- which is literally down the road from Pasadena. I shot his foundation off an email and asked them how I could volunteer and I received a fairly prompt response and soon I was in contact with Christian himself- which felt really odd- since he was an amazing runningback for the Chiefs back in the late 80s and early 90s. I worked at the youth skills camp on June 19th and was able to grab his autographs on these cards after doing a lot of just different general things to help out. I was basically a jack of all trades, taking photos, helping with set up, and providing Christian a marker to autograph kids shirts with. 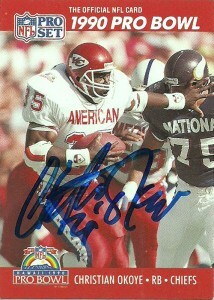 I was amazed at how many kids didn’t know who he was or that he played professional football. When I broke it to them who he was they reacted with surprised glee. The whole process was very rewarding for me as I met a couple of players and shot the breeze with Chris Hale, Ricky Ellis, and Derrick Harvey (RB San Diego St) about a variety of things from the Houston Oilers being a horrible organization to player benefits pre 1990. There’s just this worthwhile feeling I got from watching these kids learn from professional players drills, secrets of the game, and general words of encouragement. It was also nice feeling helpful and useful, but it was odd to have Christian ask me for my phone number so we could brainstorm some things for him in the future. Okoye would have a subpar rookie season in 1987, rushing for 660 yards. In 1988, despite injuries, he’d pull in another 473. 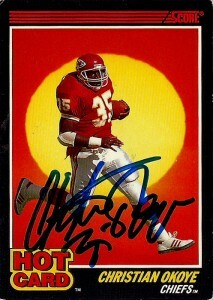 With the hiring of Marty Schottenheimer in 1989, Okoye would explode out of the gates, leading the NFL in rushing and narrowly beating out rookie Barry Sanders for the NFL rushing title with 1480 yards. He would also lead the NFL in carries with 370, and be named to the ProBowl and All Pro after the season. 1990 would see Christian again limited by injuries rushing for 805 yards, but he’d rebound in 1992 with 1031 yards and another ProBowl nod. 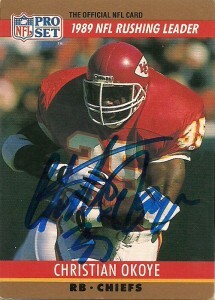 In his final season in 1993 Okoye would be limited to primarily goal line situations, and retire after the season after 6 seasons as the franchise’s all time leading rusher (since surpassed). When I met Christian I mentioned Tecmo Super Bowl to him, he told me that he was aware of the game. I explained to him that in the game that he was virtually unstoppable and he just tossed players aside on the field like rag dolls, which he found to be pretty funny. Blessed with good speed and tied for the highest hitting power in the game at a whopping 94, you just had to select Okoye plays on defense to keep him from scoring. 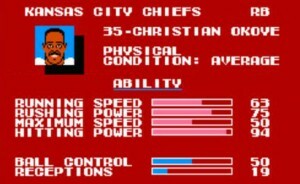 He was truly a Tecmo Super Bowl legend. Since retirement Okoye has retired to the Rancho Cucamonga area. He is the president of the California Sports Hall of Fame, runs the Christian Okoye Foundation and also is very active on the NFL Alumni circuit. He also remains one of the most popular and requested Chiefs for public speaking and appearances.